Live from the battlefield : from Vietnam to Baghdad : 35 years in the world's war zones · One Book. One Author. One Hour. Notes on front endpapers: American high command didn't like me. 1. J.P. Vann-favorite Dan Ellsberg--lost my best news source 272/227; 2. A drive from Saigon with 9 year old son Andrew; 3. Firey temper; 4. Signed autographs-Fishhook Zone; 5. Hill 875 crying on departure, p. 234; 6. Drunk, p. 224; 7. Relations with Westmoreland. [AP BAC] Westmoreland never accompanied him-201. Do you think it wise to allow reporters unfettered access to battles. Bait tactic-Gen. Norton. John Paul Vann p. 207. Wife--Nina. Lt. Gen. Julian Ewell p. 219--Hotel Royale--civilian clothes. Dan Ellsberg. How do you remember al the details on Vietnam. Hill 875 1965 Dakto p. 226. Baghdad--Resolve cracking CNN crew. Dominic Robertson's p. 349-CNN Tech-smuggled Sat phone. Pulitzer--Brown[e]/Halberstam/Sheehan p. 193. What were they trying to accomplish. Nic Robertson-British. Robert Wiener-producer. Underlinings/notes: Lamb underlinings include references to jounralists, morale of troops, human cost of battle. Notes: Names of journalists: Wes Gallagher, Horst Faas, Tom Reedy, Bob Schieffer, Bob Keatley, Bernard Shaw, and of American advisers: Major Norman Schwarzkopf, William Westmoreland, Major General John Norton, John Paul Vann. Important scoops "Gas Story,""Reporters and the War," ; observations "Cronkite--staging," "not against the war," "POW Edward Elias my roommate in Hanoi," "Final bulletin" "Arnett alone in Bagdad...CNN's younger journalists." 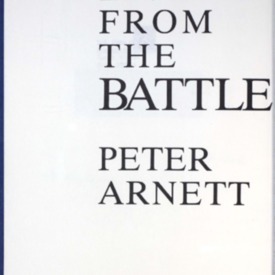 Arnett, Peter, “Live from the battlefield : from Vietnam to Baghdad : 35 years in the world's war zones,” One Book. One Author. One Hour., accessed April 24, 2019, http://booknotes.gmu.edu/items/show/280. Program air date: February 20, 1994. Peter Arnett is undeniably the dean of his generation's war correspondents, a breed apart. Daring, wily, willing to put himself at enormous risk for a story. Arnett is a thinking man and a man of action. From his youth in New Zealand in the 1940s, Arnett knew journalism would be his ticket to the world. And it was - to Bangkok; then to Laos, where Arnett swam across the Mekong River to file his dispatches from Thailand; and then on to Indonesia, where he traveled with Sukarno until he was expelled after only thirteen months for his reporting on the developing war.In 1962, Arnett was sent to Vietnam along with David Halberstam, Neil Sheehan, Mal Browne, Stanley Karnow and the rest of a new young group of foreign correspondents that would later include Dan Rather, Ted Koppel and Peter Jennings. When American ground forces were committed, Arnett went right in with them. His controversial coverage for the Associated Press incurred the wrath of President Johnson but won him a Pulitzer Prize. After the fall of Saigon, when many of his peers had gone, Arnett stayed behind to get the whole story.With the dedication, passion and intelligence that one finds in great foreign correspondents, Arnett has pursued the whole story ever since. After covering wars in Cyprus and Lebanon, he joined CNN in 1981. News was going live, twenty-four hours a day, and Arnett was going with it - from San Salvador to Moscow to Iraq. And then to Afghanistan, after the defeat of the Soviet-sponsored government, a place of anarchic conflict, where Islamic radicals plot to export terrorism to the mainland United States. Satellite communications have forever changed the way we see war. Arnett's on-the-ground reporting of the Gulf War from Baghdad had an immediacy and suspense we had not experienced before. No one who watched will ever forget. Now, in the same vivid eye-of-the-Desert-Storm way in which he reported the drama and danger of the Gulf War, Peter Arnett shares the adventures, the gambles and the glory of his lifemore than thirty-five years inside the world's war zones.